I know only the very basics of TikZ, having only used it to produce a pretty flow chart for one of my documents. I recently learned that you can use Inkscape and export to TikZ. What are the limitations of the Inkscape->TikZ workflow? Is there some compelling reason to take the time to learn TikZ (which I'm told has a fairly steep learning curve) rather than simply exporting to TikZ from Inkscape? The same options are no longer available in the newer version of Inkscape. But there are similar options when saving the PDF. 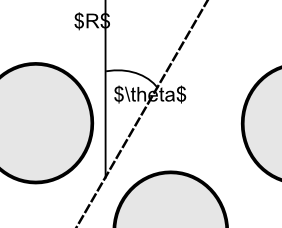 You can save your inkscape figures as pdfs and put them in your document with \includegraphics. 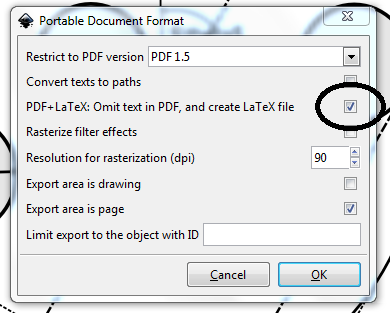 If you have text in your figures you can select the PDF+LaTeX option from the inkscape save-as pdf menu. That will create a pdf_tex file instead. You \input that file and TeX does the typesetting. This is clearly a picture that could be drawn with tikz, but I chose not to, for reasons you spelled out in your response to @HarishKumar - the longer tikz learning curve and a preference for wysiwyg for occasional use. If you did need precise placement (lines really meeting at corners) you might be able to do that with the snap-to features of inkscape. I haven't tried those yet. Not the answer you're looking for? Browse other questions tagged tikz-pgf workflow inkscape or ask your own question. Is there any way to type LaTeX code directly into the text boxes Inkscape? Best Drawing software for engineering/scientific illustrations with LaTeX?